A quick glance through our photo galleries should make it clear that cabinet refacing can result in a dramatic upgrade of the appearance of your kitchen, but you may still have concerns about the quality of the materials used in the refacing process. At Factory Direct Cabinet Refacing, our craftsmanship and attention to detail aren’t the only things we take seriously—we also use only the highest-quality materials when we work to transform kitchens like yours. Our work is built to last, and because we use superior materials when we reface your existing cabinets, drawers, and doors, you won’t have to worry about defects, warping, or fading after installation. Wood – Wood is extremely versatile in all types of construction and remodeling projects, and cabinet refacing is no exception. The wood veneers we use are durable and strong when adhered to existing cabinets and drawers. 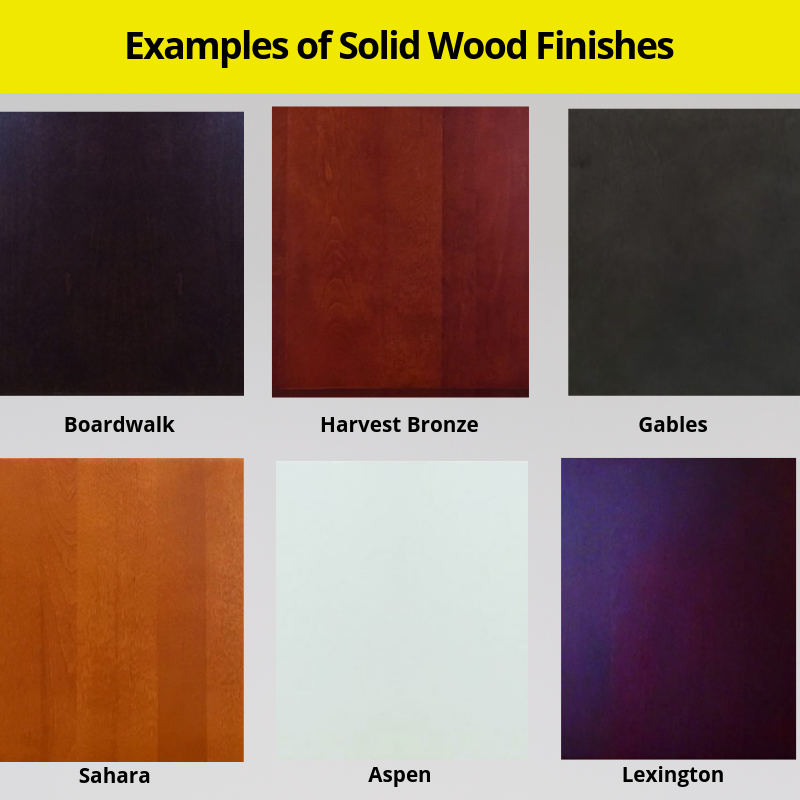 However, there are a few potential drawbacks that customers should be aware of if they choose wood veneers for their cabinet refacing. Inconsistent staining – Stains may show some degree of variation, which can result in colors that aren’t 100-percent uniform across the board. Five-piece wood doors – Wood cabinet doors and drawers are not actually refaced, but ordered new direct from the factory for all refacing and remodeling work. Most door designs require a five-piece composite construction in order to achieve the detailing that “makes” the style. These separate pieces of wood increase the chance of inconsistent staining (even when ordered direct from the factory), and over time, may be at risk for separating and warping in our warm, humid South Florida environment. 3D laminate – 3D laminate is a material that consists of one-piece MDF and a vinyl film that’s adhere to it via the combination of heat and pressure. The usage of the term “3D” when describing this product refers to the vinyl film forming to the contours of the front and sides of refaced cabinets, and for its ability to mimic the look and, most importantly, the feel of real wood. When any laminate is used, the drawers and doors arrive from the factory matching perfectly. Fully wrapped – Thermofoil provides a seamless look to kitchens, making it nearly impossible to detect refacing work. Instead, cabinets, drawers, and doors appear completely natural. Durable – Because it is seamless across its entire surface, Thermofoil holds up well over time. It’s non-porous and impervious to liquid and moisture, making it easy to clean and resistant to the damaging effects of humidity. This may be especially helpful to homeowners in South Florida, who know how damaging the moist environment can be. 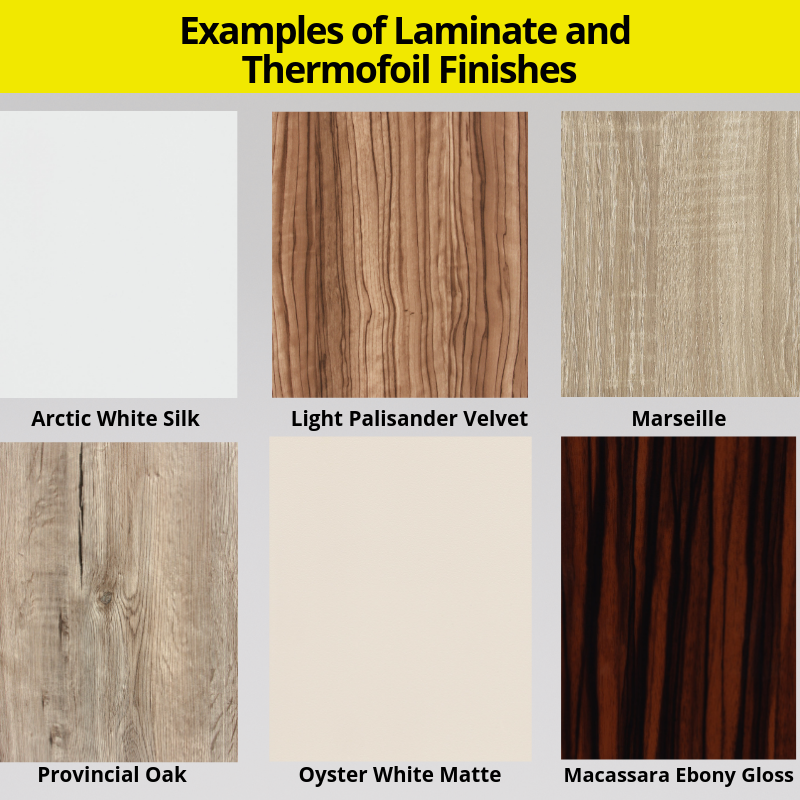 Consistent color – Thermofoil provides the most consistent and accurate colors due to the properties of the vinyl used in its manufacturing process, making it ideal for homeowners who want exact colors and uniformity throughout their kitchens. Warranty – We back all of our Thermofoil cabinet refacing work with a generous warranty to help ensure that our customers are happy with our craftsmanship and the materials we use. More options and customizations – Thermofoil uses extremely thin vinyl film, which is easily bonded to a variety of intricate shapes and designs. That means you can get customization with your cabinet, drawers, and doors, including raised panels and routed edges. Making the decision to reface your kitchen isn’t always easy. It’s our goal to make the process as straight-forward as possible, while also helping you to make the right decisions when choosing the styles and materials you want in your kitchen. Personalized quotes – Wondering how much it will cost to reface your kitchen? Get in touch with us and find out for free today. Style assistance – The sheer number of options when refacing kitchens can be overwhelming for many homeowners, especially when they want their newly redesigned rooms to match the rest of their homes. We can help you choose a look and style that will beautifully complement your existing home décor, paint, and furniture. Unobtrusive work – In addition to completing most refacing jobs within two to three days, we also make sure our work only enhances the layout and efficiency of your kitchen. Ready to get in touch with our design team to find out how cabinet refacing can transform your kitchen? Contact us in Palm Beach County at (561) 220-3510 or in Dade and Broward Counties at (954) 248-4040. You can also request a design and quote consultation here.